A man waves over a roughly boarded fence, as a guard walks intimidatingly in front of it. A group of refugee protesters, sweltering in the hot sun in Leonora — a two day drive from Perth into the desert — wave back and yell “azadi”, the Farsi word for freedom. I am one of the protesters and I am filming the protest. One week earlier, just before the start of my second year at university, I opened an email from an activist group advertising a “Caravan of Compassion” to Leonora detention centre. A few days later I was on the bus, barely knowing one other person. We spent the first night in Kalgoorlie, where we watched a documentary about the 2002 Woomera convergence. We all got excited watching the hundreds of refugee activists tear down the fences, allowing some refugees to escape. The next day we arrived at the gates of Leonora detention centre. For some of us, it was the first time we had ever seen a detention centre. We spent the weekend protesting, flying kites above the fences and visiting people inside. Someone had arranged for toy donations to give to the kids. People inside would often wave over one of the many fences and we would chant back, much to the annoyance of the guards. On our last day there, we were secretly given a letter from one of the people inside. Many people cried when they heard the story it told — of fleeing the Taliban with her children only to be locked up indefinitely in detention in Australia, with no hope of release and daily abuse from guards. Those of us who were university students took these experiences back to our campuses and began forming Students for Refugees groups. My journey as a refugee activist had begun. We discovered Murdoch University had a contract with Serco. Serco was one of the private companies employed to run the detention centres. We began a campaign to kick them off campus. We ran stalls, held speak-outs where refugees who had been in detention shared their stories, organised photo petitions and built contingents for refugee rallies. One person who joined on an O-week stall soon began visiting refugees and leading chants at rallies. Friendships were formed that have lasted years. We became part of the colourful tapestry of refugee activism in Australia. Campus refugee activism has a strong history in Australia. Under the John Howard regime, student organisations held campus rallies hundreds strong and university-wide referenda to make their campuses refugee safe havens. This meant making campuses places of sanctuary, solidarity and aid. Our actions helped build the pressure that led to offshore detention being closed in 2008 when Labor came to power — only to be re-opened by Labor a few years later. However at the time it was a significant victory and showed the movement could win. On the other side of the world, US students are organising against President Donald Trump’s attacks on immigrants and undocumented citizens. Student activist groups at more than 100 university campuses are campaigning to make their universities sanctuaries. There are ongoing discussions about what a campus sanctuary would mean. The most common meaning is not allowing immigration agents on campuses without a warrant and refusing to disclose and collect immigration status details, while also providing legal, economic, tuition and other welfare support for people are risk of deportation. They have also been campaigning for legislation changes and defiantly staring down moves to cut funding to universities that support the sanctuary movement. Over the past few years students in Australia have won victories. One of the more inspiring victories was Mojgan Shamsalipoor and her school, Yeronga State High in Brisbane. Mojgan fled sexual assault and an arranged marriage in Iran and was released into community detention on a bridging visa. She began attending school, met the love of her life and planned to become a midwife. 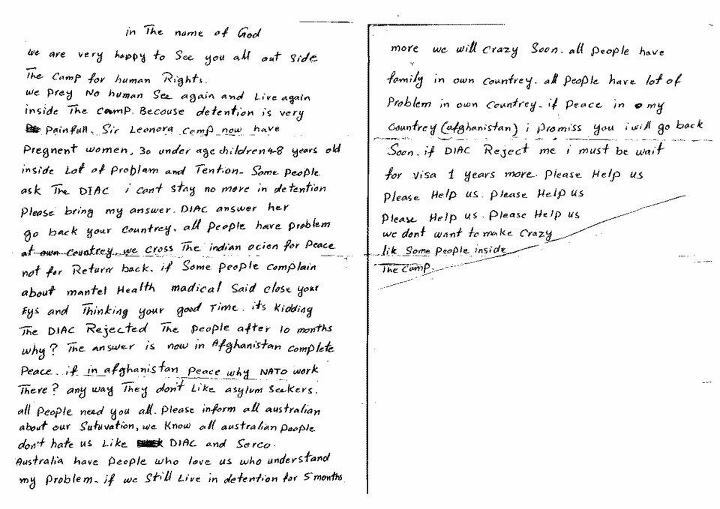 Then, one day the department of immigration decided Mojgan was not a refugee and gave her two options: return to Iran or be sentenced to indefinite detention in Darwin’s Wickham Point detention centre. Fearing persecution in Iran, she chose the latter. Her high school community then began campaigning for her release. They took their struggle all the way to Canberra and her story was told on ABC’s Australian story. She was eventually given a bridging visa and has remained in limbo ever since. In Newcastle last year another victory was won by student activists. They forced their university to cut its contract with Broadspectrum, a company with contracts to run offshore detention centres. Late last year students occupied immigration offices in Canberra, Newcastle and Sydney as the Australian government forcibly closed the Manus Island detention centre, leaving the refugees stranded on Manus Island without access to adequate healthcare, safety, food and housing. This made national press at a time when people were becoming outraged at what was happening and looking for ways to get active. I often get asked whether it is worth campaigning for refugee rights when nothing seems to be changing. The history of Australia’s refugee campaign shows it is possible to win victories when enough people mobilise. This would later be the foundation for a short documentary, “For my Friends in Detention”, which I made in my film class at university. It looks at why protesting is important to people in detention. It has since been selected for film festivals around the world and the message has resonated with a lot of other people in the campaign. For this reason alone it is worth being involved in the campaign: it means a lot to the people on Manus Island and Nauru who have spent more than four years in detention. You don’t need to jump on a bus with a bunch of strangers heading out to a remote detention centre to get involved. You can come to the Palm Sunday rallies for refugee rights on March 25. There are student refugee rights groups on many campuses organising contingents to the marches, so get involved and become a part of this important campaign.